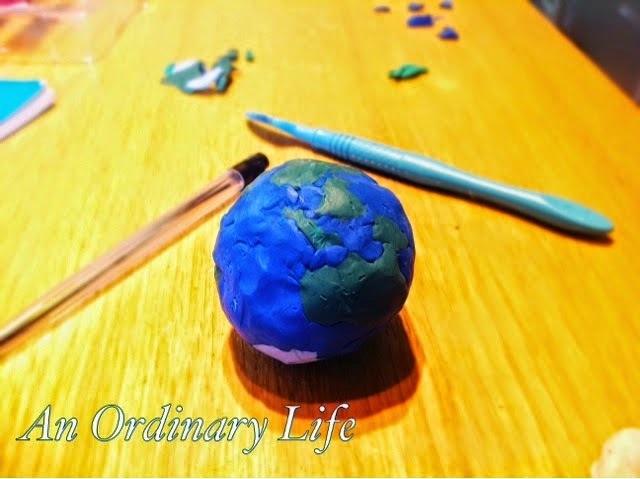 An Ordinary Life : What's inside the Earth? Optional - you can use some paper and a pencil to label the stages if you like. 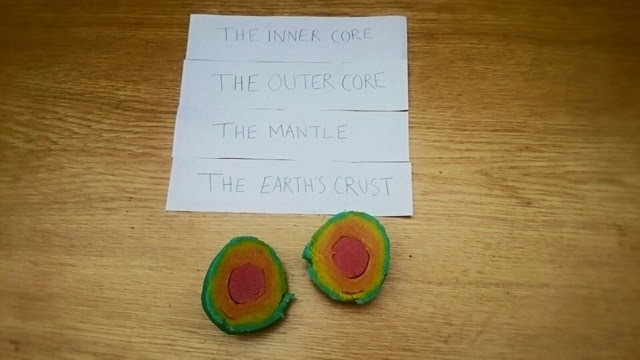 The Earth is made up of four layers. No one knows much about what is under the surface of earth but from scientific study this is what they have found so far and their theory on what is beneath our feet! The inner core is a solid iron core made up of crystalline - this simply means that is it full of crystals - and is surrounded by a liquid. The liquid that surrounds the inner core moves quickly which is what makes the planet's magnetic field. 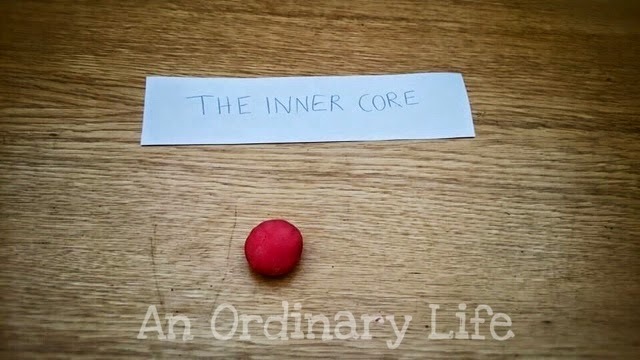 For the inner core we rolled up a small piece of red play dough. 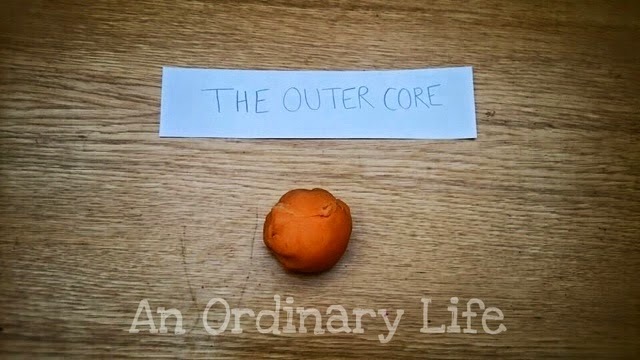 THE OUTER COREThe outer core is a liquid layer made mostly of iron with a temperature ranging from 4000 degrees C - 6000 degrees C.
For the outer core we rolled flat a piece of orange play dough until it was big enough to wrap round our inner core. 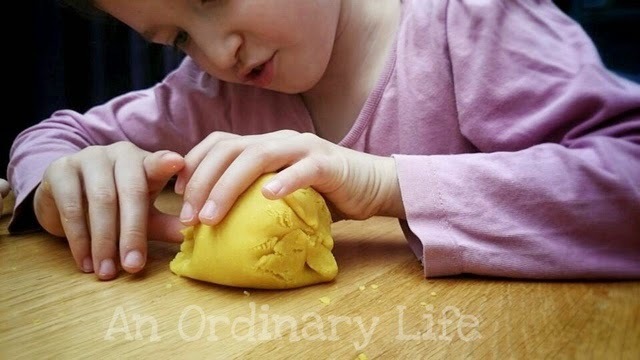 We took off the excess bits of play dough. The Mantle is not liquid but solid rock. However, the rock is so hot that it does flow! Because it flows, even though it moves very slowly moving currents as the hot rock, that is close to the outer core rises and the cold rock nearer the Earths crust falls. 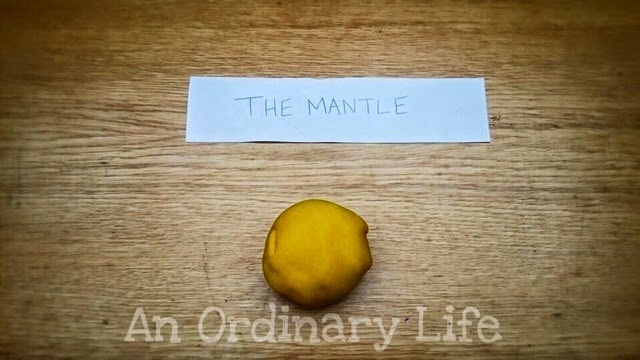 For the Mantle, we rolled flat a piece of yellow play dough until it was big enough to wrap right round the inner and outer core. Again we took away the excess play dough to neaten it up. The Earth's crust is the thinnest of the four layers. It is made up of a mixture of different rocks. It is the layer that we all live on. 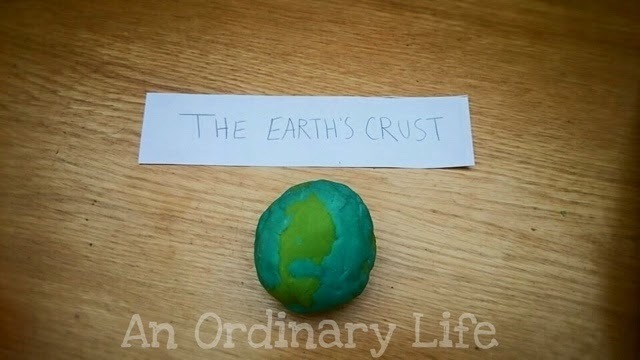 For the Earth's crust we flattened out the blue and the green play dough. Then we got our blunt knife and we cut out the shapes of the continents from our atlas book as bet we cool. I told the girls this wasn't really important to be accurate, it was just fun to look at the world and learn about the countries and continents and where they are on the planet as we went. When our Earth was done. With a knife we sliced through the middle to see our layers. To do this I applied little pressure and used a really sharp knife and just sawed through it very slowly so to keep it's shape. That is so interesting to do the things like that with the chikdren together. That will make your relationships better.